In a few months, we will mark the five-year anniversary of the Deepwater Horizon oil spill. The accident released millions of barrels of oil into the Gulf of Mexico, causing extensive impacts on the marine ecosystem, wildlife habitat, and the fishing and tourism industries in Louisiana and other Gulf states. Like the 1989 Exxon Valdez spill in Alaska and the Union Oil spill off the coast of Santa Barbara twenty years before that, Deepwater Horizon focused public attention on the environmental risks associated with energy. These issues are back on the national agenda following two energy policy announcements last week by the Obama Administration, announcements that come amid a domestic oil and gas boom in the US. A look at the polling data shows that Americans favor both environmental protection and expanding fossil fuel extraction. But it also suggests they aren’t certain how to weigh tradeoffs between the two. In the first of two major initiatives, President Obama announced plans to designate more than 12 million acres of the Arctic National Wildlife Refuge (ANWR) in Alaska as wilderness and to close off ANWR’s Coastal Plain from oil and gas exploration. Environmentalists have long argued that ANWR should be off limits to development of any kind because of its unique arctic ecosystem, which provides habitat for diverse wildlife, including the Porcupine River caribou that migrate to the ANWR’s Coastal Plain each year. 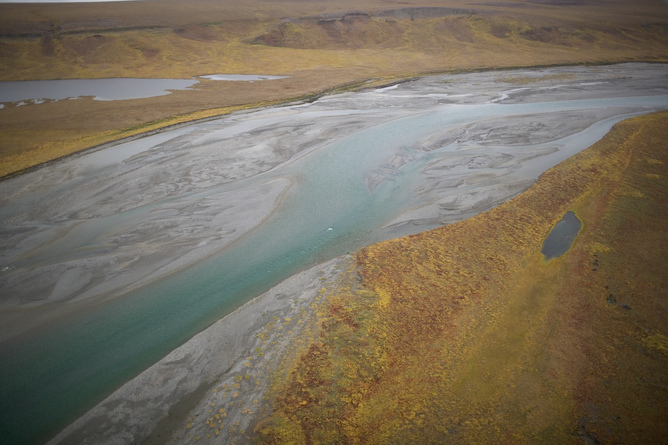 The oil and gas industry argues that the untapped resources in ANWR are potentially immense, and that they can be harnessed with minimal environmental impact. A few days later, in the second policy announcement, the Department of Interior (DOI) released a draft of its proposed five-year oil and gas leasing program for the Outer Continental Shelf. The proposed plan calls for opening some new areas to development, most notably federal waters along the Atlantic seaboard from Virginia to Georgia and some small areas in Alaska’s Cook Inlet and Beaufort and Chukchi Seas. These waters have been off-limits until now, but the industry and many elected leaders in these states (of both parties) have long advocated for their opening. At the same time, the DOI leasing plan proposes closing off from future development other potentially resource-rich areas in the Arctic, namely the area known as the Hanna Shoal, which provides habitat for walruses, seals and other marine wildlife. These proposals —- to expand energy development in some areas, while prohibiting it in others -— reflect an effort by the Obama Administration to continue its “all of the above” strategy. Rather than favor one type of energy source – fossil fuels versus solar and wind, for example – the stated purpose is to push forward on all types of energy sources, all while also protecting environmentally sensitive areas. The ANWR and offshore leasing program proposals were received in the usual way here in Washington. Most in the environmental community cheered the ANWR decision, but bemoaned parts of the offshore leasing plan. Among the criticisms was that opening up new areas to fossil fuel development conflicts with President Obama’s stated climate change goals. For their part, many in the oil and gas industry expressed support for the parts of the proposal that would expand development opportunities, but lamented the decisions to set ANWR and parts of the Arctic off limits. Where does the American public stand on these issues? Do people support the expansion of energy development or do they prioritize environmental protection? Perhaps not surprisingly, each side in this debate argues that they have public opinion on their side. And, as is often the case with polling, there is some merit to these claims. The data presented in the graphic below are responses to a question that the Pew Research Center has been asking in recent years about Americans’ support or opposition to the government allowing more offshore oil and gas drilling in US waters. 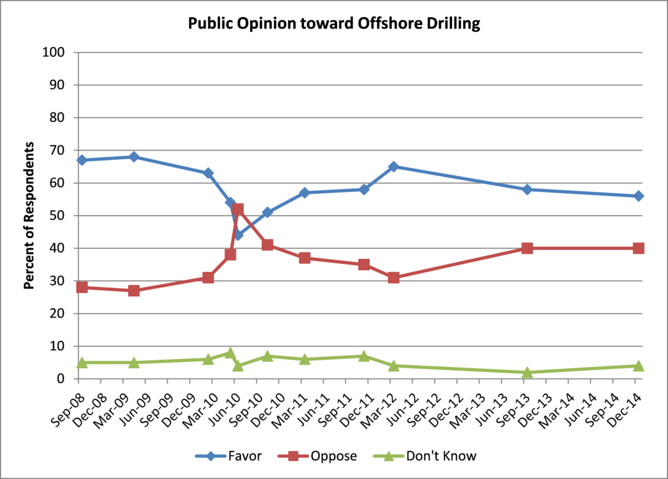 What is clear from the data is that, over the past six years, the US public has consistently and often with strong majorities expressed support for the expansion of offshore drilling for oil and gas. The obvious exception was in the May 2010 poll, which was conducted in the midst of the Deepwater Horizon oil spill. Response to question: As I read some possible government policies to address America’s energy supply, tell me whether you would favor or oppose each. Would you favor or oppose the government allowing more offshore oil and gas drilling in U.S. waters? Responses to this question, however, do not provide a complete reading on how Americans weigh potential tradeoffs between energy development and environmental protection. And, when Americans are asked a similar question about the expansion of energy development, but this time with an option to prioritize environmental protection, the main takeaway is less clear. 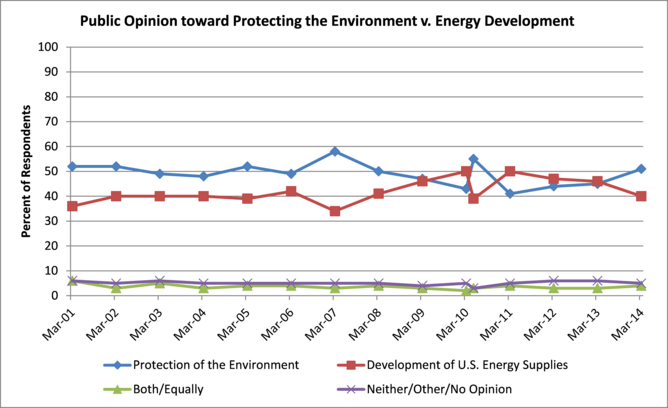 The next graphic shows responses to a question that Gallup has since 2001 routinely included in its surveys, which more directly asks Americans to evaluate the energy development-environmental tradeoff. Specifically the question asks people to register their agreement with either a statement that emphasizes protection of the environment, or one that emphasizes development of domestic energy sources (not specifically offshore resources). Response to question: With which of these statements about the environment and energy production do you most agree: protection of the environment should be given priority, even at the risk of limiting the amount of energy supplies—such as oil, gas, and coal—which the United States produces, or development of U.S. energy supplies—such as oil, gas, and coal—should be given priority, even if the environment suffers to some extent? These data reveal a more complicated picture of US public opinion. From 2001 to 2007 the public prioritized protection of the environment but, beginning in 2008, Americans’ support for developing domestic energy supplies began appreciably to climb and surpass protection of the environment, with a short-lived interruption in a poll conducted one month after the Deepwater Horizon accident. Last year, however, protection of the environment re-emerged with majority support. The fluctuating nature of recent public opinion suggests sensitivity to external factors such as accidents, oil prices, and Middle East politics. But more broadly, one can reasonably interpret the US public as divided on how to achieve the right balance between energy development and environmental protection. And it is worth noting, that when pollsters ask questions specifically about drilling for oil and gas in ANWR, the level of support and opposition has tended to oscillate along these same lines. This brings us back to the announcements made last week by the Obama Administration. The ANWR and offshore leasing plans satisfy neither the environmental community nor the oil and gas industry, but the mix of proposals seems largely in keeping with the preferences of an American public that wants both more energy production and environmental protection. While there may be no “free lunch,” the Administration’s proposals seem to generally correspond to what the public as a whole thinks is possible and appropriate.